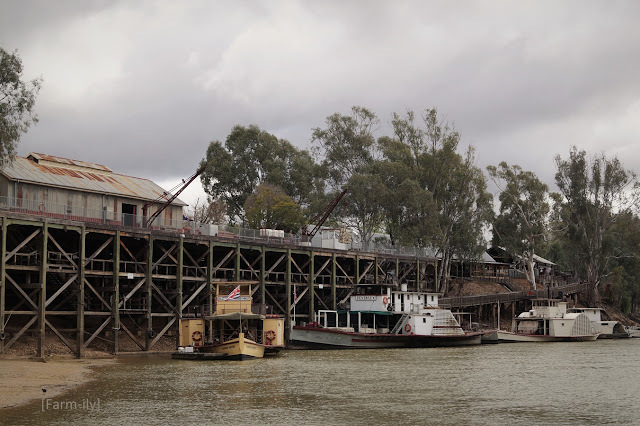 Built in 1865 the Echuca Wharf sits on the Victorian side of the Murray River about 1½ hours drive west of our farm. It was once Australia’s largest inland port where wool & other produce was bought in from isolated stations along the Murray Darling river systems to the railhead at Echuca, transported to Melbourne and then shipped overseas. Echuca was also the main shipbuilding centre for river transport. The wharf is over 10m high with 3 levels to accommodate the changing levels of the river... it is currently very low. The Port of Echuca now houses the largest collection of paddlesteamers in the world. The PS Adelaide (pictured far right) was built in 1866 and is the oldest wooden hulled paddlesteamer still operating in the world. It is quite a few years since we have been to Echuca, but I found the different wharf heights amazing. It was really hard to imagine the river level being so high. The floods that broke the millenium drought, I wonder if the river level became really high then. Clearly when the wharf was built high river levels happened frequently. Interestingly the highest flood level in Echuca of 96.2m (above sea level) was in 1870 only a couple of years after the wharf was constructed. Since then the biggest floods have all occurred within the last 45 years -1993, 1973, 1974, 1992 & 2016. 2011 (the end of the millennium drought) was the 7th highest at 92.85m. Yesterday the height was 86.53m, 6.32m lower then the flood of 2011. Some day I hope to get there. And yes, those high wharves are incredible. Wonderful history, but so sad to see the water level so low.